Recently I had a client ask me to convince him that buying a certain replacement car would be the smartest choice for him. You see he has a world class “S Class” Mercedes Benz in his garage. He is a tad frightened by the prospect of keeping his beautiful piece of German engineering in running condition. His fear is very well founded indeed. The smallest problem on his used Benz can add up to a series of small (mis)fortunes. Unless you have a need for the status, a used Mercedes is just not a wise investment to keep around. My client is just starting to experience the first of many expensive maintenance requirements, just like he did with his previous Mercedes which was so staggeringly expensive to keep. He has spent way too much just to keep it running. My advice to him was simple. Replace it with the best built car money can buy. I am not talking about another overstuffed, depreciation dog Mercedes. No, I am recommending a Hyundai. Mercedes Benz is a fine automobile, no doubt. No other car manufacturer can match the history, the prestige, the technological innovativeness and engineering prowess that can be claimed over decades, if not almost an entire century of high quality production cars year over year. Mercedes Benz happens to be the world’s oldest automotive brand still in existence today. As new cars they carry the badge of having achieved the pinnacle of success. However, that prestige would cost you a mountain of money in depreciation. Maybe being comfortable wasting money comes with that attitude. However my job is to help people make smart choices. There is no honor in throwing money out the window unless it is for philanthropic purposes. As a professional car buyer who is in the business of helping people purchase the best used car for their hard earned money you would expect that a Mercedes Benz would be a car that I would recommend to my car buying clients who are looking for a blend of fashion, technology, performance and value all in one, especially after the heavy depreciation of the first few years. One would expect that the Benz would be a high quality used car pick. Unfortunately that is not the case. They are next to last in recommendation due to cost of ownership. You will spend a small fortune to keep your handsome German machine running. They become more of a driveway sculpture than an everyday driver. Enter the newest member to the automotive world. Hyundai. Once thought of as the laughing stock, Hyundai has taken the car industry by storm. From its humble beginnings in 1986 with the entry level Exel, a $4995 box of bolts, Hyundai has been chasing the best car companies for market share and now have grown into a formidable, totally dominant car manufacturer turning out the highest quality cars with the latest technologies and the best warranties, all at affordable prices. Not only that but they are taking on and beating the crap out of the wyly Japanese who, up till just recently, have been firmly in the drivers seat on such matters. Hyundai has also been busy pursuing the high end luxosedan automakers with their Genesis and Equus lines. 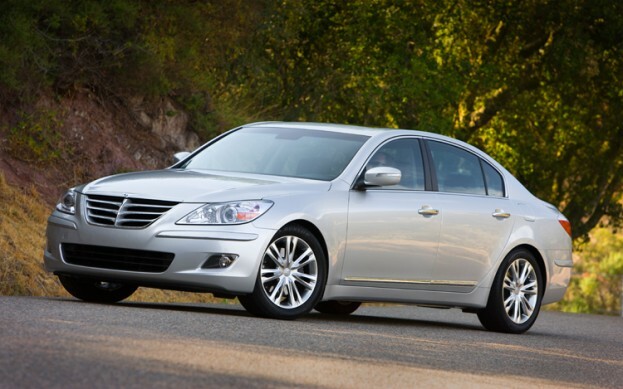 2006 marked the year in which Hyundai surpassed most of the competition. It was that year that J.D. Power and Associates placed Hyundai as third in overall customer satisfaction, after Porsche and Lexus and ahead of arch-rivals Toyota, Honda and well ahead of, you guessed it, Mercedes Benz. Since then it has only improved year by year for the once fledgling little company. These days it is widely considered by many experts, including myself that Hyundai has become the true leader. It has in short accomplished what Toyota and Honda did in the 80’s and 90’s. And it is happening right now, in front of our noses. Which brings me back to my client. Getting rid of the Benz makes sense in itself. Buying a Hyundai turns the entire car scenario on its head and gives you everything that the Benz did not. It is a hard pill to swallow that such a car company can be so good, so fast. Public opinion is changing slowly. But the experts know, and of course the other car companies know. In fact they know it best. They are now the ones chasing the one that was once chasing them.